Designed primarily for use with the Baitboat to enhance 100% particle deployment. The Baitdroppers can carry your rig as well as particles and after despatch the Baitdroppers are towed back behind the Baitboat. 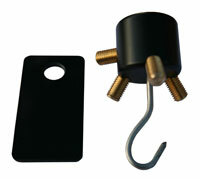 The Bait Droppers are designed to use with the Baitboat and to drop 100% of particles including your rig, if you wish. Place you particles into the Dropper with or without your rig. It is advisable that the last inch or so is filled with larger bait to ensure that the particles do not fall out. Open the relevant door you wish to place the Dropper in and pass the Dropper in through the door concerned and close it, ensuring that the open end of the Dropper is facing the back of the boat. Locate the cord with the rubber ring on and pass the rubber ring over the aerial. You are now ready to use the Bait Dropper. When the door opens the Dropper will fall out of the hopper, empty it’s contents, and be trailed back behind the boat. This is a light operated from either a push button or by a pressure pad, powered by a separate 12 volt supply (not Included). The pressure pad is placed at the side of the bedchair and the push button at the side of your pillow on the bedchair. When you have a run in the middle of the night you swing your legs off the bedchair you touch the pressure pad and the light is switched “on” until you stand on the pressure pad again. The same results can be achieved by using the push button. Therefore you can switch the light “on” with the pressure pad and turn it “off” with the push button and visa versa. This marker float system is designed to be deployed at the start of the session and retrieved when the session in finished. There are four colours supplied per system to cover all lighting conditions all neatly fitting into a draw string bag. 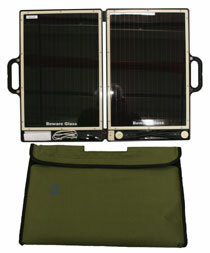 The solar panel charger can be used with any of the boats, to charge both the transmitter and the boat at the bankside. It will still charge in overcast or wet conditions as it is completely waterproof. This is an excellent alternative to the bankside charger as it is light to transport and no additional power supply is required. To use with the Procat you will also require the 'Solar panel adaptor head'. This solar panel is designed to pack away the same as a briefcase. When opened it has two external legs which open out to support the panel at approximately 45%. It comes complete with leads the charge the boat and transmitter either separately or at the same time. This panel is approximately 2½ times more efficient than the standard solar panel and comes supplied with a padded waterproof bag. This view shows the panel packed into its bag. For the Baitboat, this allows the flexibility of the aerial for use when working under overhanging foliage. It does shorten the working range by approximately 50%. A powerful, removable torch which has an independent power supply that can be used with any of the boats for additional lighting at night. Easy to use. Just plug the meter into the charging socket on the boat and read the minutes running time remaining. For use with Heavy Duty batteries take the reading and add 40% of the reading to calculate the remaining time. The digital battery meter will only display a reading when it has put the batteries under load. Note: Only for use with the Microcat & Baitboat. Easy to use. Just plug the meter into the charging socket on the boat and read the minutes running time remaining. For use with Heavy Duty batteries take the reading and add 30% of the reading to calculate the remaining time. The digital battery meter will only display a reading once the batteries have been put under load. Note: Only for use with the Technicat. Easy to use. Just plug the meter into the charging socket on the boat and read the minutes running time remaining. The digital battery meter will only display a reading once the batteriess have been put under load. Note: Only for use with the Microcat "HD". Suitable for the Microcat, Technicat or Baitboat, this links your car or leisure battery to the boat (not transmitter) to allow charging where no mains supply is available. It allows you to nearly fully charge the boat. You are supplied with two leads, one to connect the boat direct to the cigarette lighter socket in the car and the second to connect the two leads together and crocodile clip direct to a car battery. The light can be fitted to the stern of any of the boats in conjunction with the spotlight to help navigation at night. With new batteries it will emit a very bright light for 50 hours or 100 hours if set in the blink mode. A custom designed cover to protect the transmitter from the rain. 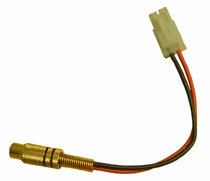 It allows you to use the transmitter during damp conditions. This neck strap is for the transmitter (handset) and had a quick release coupling enabling you to remove the transmiitter leaving the strap around your neck. The covers are only for the Microcat and fit tightly into the hoppers to curtail any movement of the bait. Also can be used to cover ordinary bait from wildlife. The covers are only for the Baitboat and fit tightly over both hoppers to stop any movement of the bait. Also can be used to cover ordinary bait from wildlife. This hopper cover is only suitable for the "Technicat" and fits tightly into position and can be used as described above. This mounting kit for the Graphic Receiver enables you to mount the Graphic handset on a tripod for easy viewing. If the bankstick legs are long enough then this mounting will double up as a weighingstation. (banksticks not supplied). 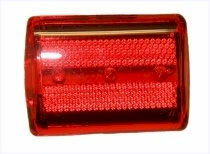 This lead has to be used along with the solar panel (above) when using in conjunction with the Procat (only). A decal sheet gives you chance to personalise your boat to your own tastes. Each sheet is self adhesive and waterproof and can be cut to the desired shapes. The lead is purely for the Microcat and offers you the opportunity to charge a pair of batteries while not installed in the boat. This adaptor allows you to charge the transmitter battery pack when it is not situated in the transmitter. "Microcat MkI & MkII" and the "Technicat MkI" only. This mat is padded, waterproof and has "D" rings in each corner to allow it to be secured to the bank. Allowing you to have a dedicated area where the boat can be left, when not in use, without being damaged on the bottom. It folds into three and can be packed in the bag supplied. The covers are only compatible with the Microcat and were designed to cover the battery boxes and keep out the vast majority of water that may come over the upper hull whilst using the boat. They are manufactured from transparent strong plastic and attached to the boat by self adhesive fasteners. These are also available for the Microcat "HD", as above, but have two holes to allow for the lifting handles (please specify when ordering). 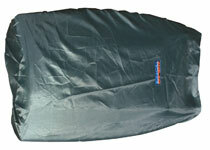 A cover allowing you to leave the boat outside the bivvy and it be protected from either the rain or early morning / evening dampness. A spare battery pack for the Microcat MkI & MkII and the Technicat MkI transmitter. These are for the Microcat & Technicat only, and can be either standard 6 volt 7Ah or heavy duty 6 volt 10AH. The batteries are supplied in pairs, complete with self adhesive fastenings. They only require to be charged, to be ready for use. The Microcat "HD" operates on the heavy duty batteries only. 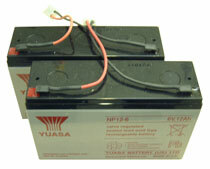 A spare 7.2 volt Nmh 4500mAh boat battery for use with the Procat only. This additional battery bag compliments the above range of accessories by allowing extra space for more batteries and the graphic echo sounder handset. This fast charger is for the Procat boat batteries. It will fast charge the battery either from the mains at home or from a leisure/car battery. The charger changes from bulk charge to trickle charge automatically and will charge a Procat boat battery in approximately 2 hours. A very high quality, padded waterproof custom carry bag specifically designed for the boat. It contains three internal pockets for accessories and transmitter and one external large pocket to accept the solar panel. It comes complete with padded carrying handles and an adjustable padded shoulder strap. A very high quality, padded waterproof custom carry bag specifically designed for the boat. It contains three external pockets for accessories and the transmitter. It comes complete with a slot to enable you to carry the boat holding the boats handle and an adjustable padded shoulder strap. A very high quality padded waterproof custom carry bag specially designed for the Microcat "HD". 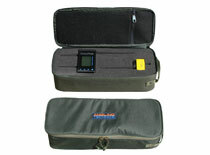 It contains three internal pockets for the transmitter and other accessories and a large external pocket. It comes complete with carry handles and an adjustable padded shoulder strap. 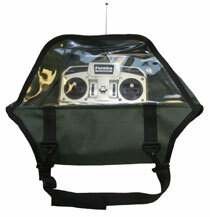 A very high quality, padded waterproof custom carry bag specifically designed for the boat. It contains two external pockets for accessories and transmitter. It comes complete with padded carrying handles. A very high quality, padded waterproof custom carry bag specially designed for the Technicat. It contains two internal pockets for the transmitter etc. and one large external pocket. It comes complete with carrying handles and a removal padded shoulder strap. This custom carry bag was specifically designed to carry the GPS navigator system. It is waterproof and foam lined. There is an internal zipped pocket to store your instructions and has a carry handle. (GPS System not included). The PVA enclosure has been designed as a hollow, one ended, box that fits just inside the top of the hopper on the Microcat and two side by side on the Technicat and is held in position by self fastening strips. The purpose of the enclosure is to position it just inside the hopper according to the rig length so that you can push inside the PVA bag to keep it covered from the rain and or any dampness. 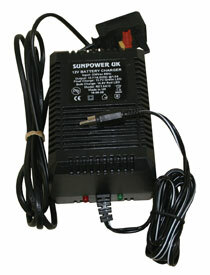 This battery charger utilizes the latest computer controlled technology designed to give greater charging control of Lead Acid Batteries. The charger has two LEDs (green & red) to indicate which charging cycle the charger is on. Once the charging cycle is finished then the charger switches to a trickle charge and can be left on indefinitely. This charger is for the "Microcat", "Baitboat" and "Technicat". 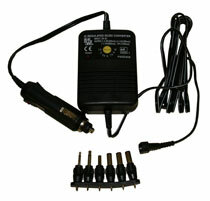 This converter can be plugged into a cigarette lighter socket and reduce the voltage as required. The options are 12 volts down to 1.5 - 3.0 - 4.5 - 6.0 - 7.5 - 9.0 with six choices of jack plug. At last your boat can match your other gear! These Realtree ® camouflage decals sets are manufactured in automotive-grade self adhesive vinyl, designed to withstand the wear and tear of everyday life. Simple to apply, they are durable, yet easy to remove in the unlikely event you ever change your mind. Click here for further details about the designs available. 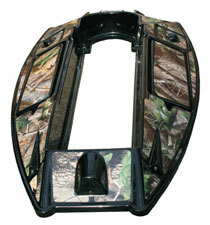 We are now in a position to supply any NEW boat coated in your favourite Realtree pattern. Now your boat can match all the rest of your fishing gear. This is not available for existing boats. Click here for pricing and more images.